I am in love with our new bathroom fixtures! Though it may seem a bit batty to include this picture, given how I feel about our sink hardware, it was inevitable for them to appear here eventually. This photo would likely be a good candidate for Carol Leigh's White on White technique. I haven't unpacked my course notes from her classes yet and I can't remember how to make the white on white effect so this will have to do for now. 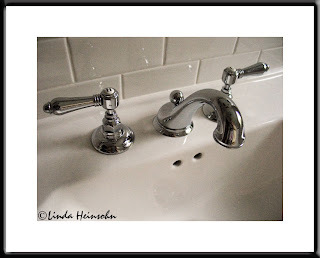 I love the curving lines of the faucet and the classic details of the water taps.